This six year old Jack Russell terrier is presented you because he seemed to have an uncomfortable eye over the weekend but appears to have recovered now. What can you see and what might his problem be? What might you see in his other eye? 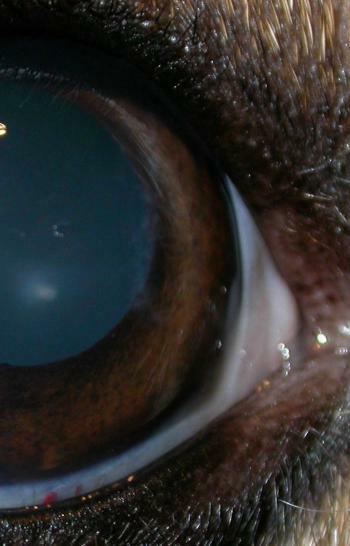 There is a central area of corneal oedema in that image and, given his breed, the likelyhood is that he had an anterior lens luxation which caused endothelial cell dysfunction with subsequent corneal oedema, before the lens fell back through the pupil. There was indeed a ‘wobbling’ appearance to the pupil which we term iridodonesis (because ‘a wobbling appearance’ deosn’t sound very scientific does it?!) and this is caused because the iris isn’t supported by the posteriorly luxated lens any more. Here is the other eye – a tricky sign to spot here but can you see a whisp of vitreous poking through the pupil on the right hand side? This lens is subluxated as well and both really need to be removed. 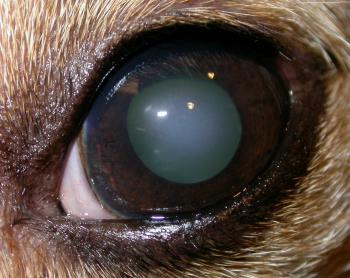 This entry was posted in Cases and tagged corneal oedema, dog, lens luxation. Bookmark the permalink. A puppy with unequal eyes!